Kenna JG. Human biology-based drug safety evaluation: scientific rationale, current status and future challenges. Expert Opinion on Drug Metabolism & Toxicology. 2017;13(5):567-74. Kenna G. Integrating DILI hazards enables prediction, assessment, and management of human risk. Drug Metabolism and Pharmacokinetics. 2017;1(32):S3. Ram R. Launch of the Alliance for Human Relevant Science. Alternatives to laboratory animals: ATLA. 2017 Mar 1;45(1):49-53. Archibald K, Drake T, Coleman R. Barriers to the uptake of human-based test methods, and how to overcome them. Alternatives to Laboratory Animals. 2015;43(5):301-8. Coleman RA. Human-based systems in drug and chemical safety testing–toward replacement, the ‘single R’. Alternatives to laboratory animals: ATLA. 2014;42(6):357-66. Clotworthy M, Archibald K. Advances in the development and use of human tissue-based techniques for drug toxicity testing. Expert Opinion on Drug Metabolism & Toxicology. 2013;9(9):1155-69. Clotworthy M. Proceedings of the human tissues conference, House of Lords, 20 October 2009: Introduction. Cell and tissue banking. 2011 Feb 1;12(1):1-2. Coleman RA. Efficacy and safety of new medicines: a human focus. Cell and tissue banking. 2011 Feb 1;12(1):3-5. Clotworthy M, Archibald K. Introduction to the proceedings of the Speed and Safety in Drug Discovery Symposium hosted by the Safer Medicines Trust. Preface. Alternatives to Laboratory Animals: ATLA. 2009:37;i-ii. Archibald K, Clotworthy M. Comment on ‘The ethics of animal research’ by Festing & Wilkinson. European Molecular Biology Organisation. 2007;8(9):794-6. Bailey J. Non-human primates in medical research and drug development: a critical review. Biogenic Amines. 2005;19(4):235-56. Bailey J, Knight A, Balcombe J. The future of teratology research is in vitro. Biogenic Amines. 2005;19(2):97-146. Coleman RA (Ed). Human based systems for translational research. 2014, Royal Society of Chemistry. Light DS, Aleo MD, Kenna JG. Interpretation, Integration, and Implementation of In Vitro Assay Data: The Predictive Toxicity Challenge. In Chen M., Will Y. (eds) Drug-Induced Liver Toxicity. Methods in Pharmacology and Toxicology. 2018 Humana Press, New York, NY. Archibald K, Coleman R, Foster C. Open letter to UK Prime Minister David Cameron and Health Secretary Andrew Lansley on safety of medicines. The Lancet. 2011;377(9781):1915. Archibald K, Baxter AD, BeruBe K, Bunton D, Clotworthy M, Coleman R, Foster CS, Hillier C, McFarlane M, Patel A, Pierscionek B. Safety of medicine and the use of animals in research. Lancet 2011;378(9802):e2. Archibald K. Moving away from animal research for clinical benefit. BMJ January 29, 2007. Archibald K. Medical progress: thanks to clinical research, not animal research. BMJ January 23, 2007. Archibald K. Animal testing: call for open, scientific debate. The Lancet. 2004;364(9444):1486. Archibald K et al. Using animals to test drugs is outdated and unreliable. The Observer. August 31, 2014. Archibald K et al. Politicians impeding medical advances. The Sunday Times. September 7th, 2014. Archibald K. Scientists versus evidence. The New Statesman. January 4, 2013. Archibald K. New techniques mean animal testing is totally out of date. The Observer. August 5, 2012. Archibald K. Interview with KA about Safer Medicines. Live a Better Life magazine. Issue 1, November 2012. Archibald K. Animal testing futile. The Herald. January 12, 2009. Archibald K. Alternatives to animal experimentation. The Herald. November 17, 2008. Clotworthy M. Hypocrisy on animal tests. The Scotsman. November 7, 2008. Clotworthy M. The Telegraph. October 30, 2008. Archibald K. Monkey tests don’t work. The Daily Mail. May 29, 2008. Clotworthy M. Testing animal tests. The New Scientist 2008 (2652): 16-17. Archibald K. Monkey trials are doomed to fail. Mail on Sunday. December 17, 2006. Archibald K. Animal testing helps us discover cures for mice, not men. The Independent. November 18, 2006. Bailey J. Drugs Blunder. The Independent on Sunday, 2 April 2006. Coleman RA, Tsaioun K, Archibald K. A pragmatic comparison of human in vitro with animal in vivo approaches to predicting toxicity in human medicines. March 27, 2014. Archibald K, Coleman RA. A humane solution. How to stop adverse drug reactions. The New Scientist 2012: 216 (2895): 32-33. Clotworthy M. Could we have safer medicines through non-animal testing? Scientists for Global Responsibility Newletter. Issue 37, Spring 2009. Archibald K. Which would you trust to protect your health? Lifescape Magazine 2009. Clotworthy M. Safer Medicines. Lifescape Magazine. Feb/ March 2008. Archibald K. It’s time to test the testers. Guardian 5 May 2006. 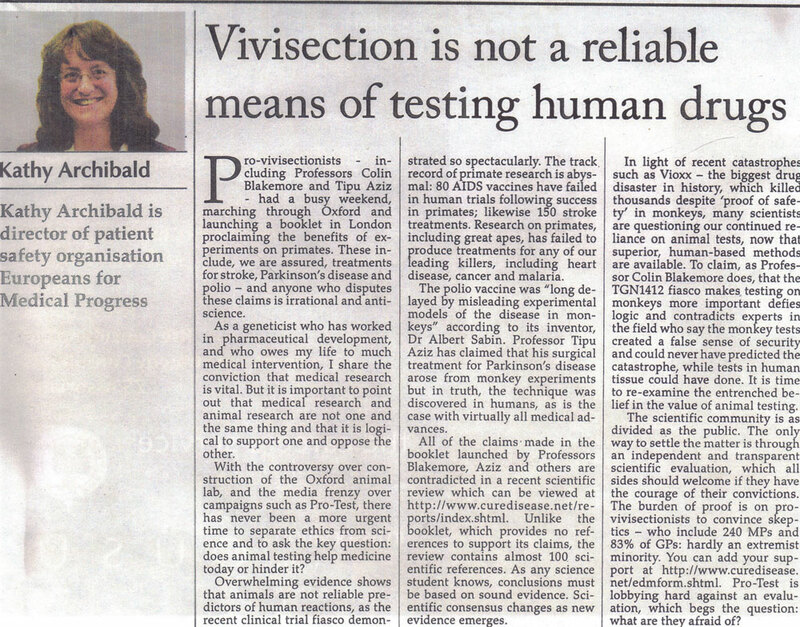 Archibald K. Vivisection is not a reliable means of testing human drugs. The Oxford Student. Archibald K. Test people, not animals. The New Scientist 2005; 187(2518): 24. Archibald K. Animal testing for drug safety is unreliable. Spiked. 3 March, 2005. Kathy Archibald. Replacing animal testing – the future is already here. 4-part blog for Veganuary. Brizmohun, N. Is the End in Sight for Animal Trials? Regulatory Affairs Journal (RAJ) Pharma. 5 Feb 2009. Bhogal, N. Speed and safety in drug discovery: a brief conference report. Alternatives to laboratory animals: ATLA. 2009;37(1):143-5. McColl, I. Testing conditions. The House Magazine. 19 October 2009. Matthews, R. Why cats should all say no to an aspirin. Daily Express. July 11 2007. Stephenson, J. While the debate rages on, lab rats are still suffering. The Independent. 16 January 2006. James, P. Scientist: Animal tests don’t work. The Newcastle Journal. 24 Feb 2005. Meiklem, PJ. Testing on animals has slowed search for cures claims leading UK scientist. Big Issue Scotland. 25 July 2005. Stephenson, J. A victory for good sense – and guinea pigs. The Independent. 29 August 2005.